Born: October 7, 1957, in Pittsburgh, PA. The son of (late) Donald P. and Geraldine Little Burns. Education: Secondary education at Lincoln High School (graduated 1975) in Ellwood City, PA.
B.A. degree (Philosophy and Sociology – graduated 1979) from Duquesne University, Pittsburgh, PA while in priestly formation at St. Paul Seminary. Received a Master of Divinity degree and a Master of Theology degree from Mt. St. Mary Seminary, Emmitsburg, MD. Ordained: Ordained a priest for the Diocese of Pittsburgh by the Most Reverend Vincent M. Leonard on June 25, 1983. Ordained a Bishop at Saint Paul’s Cathedral in Pittsburgh on March 3, 2009, and installed as Bishop in the Diocese of Juneau at Saint Paul the Apostle Catholic Church on April 2, 2009. Installed as Bishop in the Diocese of Dallas at the Cathedral Shrine of the Virgin of Guadalupe on February 9, 2017. 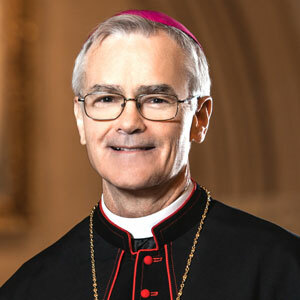 (1999-2008) Was co-chair of the Third Continental Congress on Vocations to Ordained Ministry and Consecrated Life in North America called by His Holiness Pope John Paul II and took place in Montreal, Canada; April 18-21, 2002. 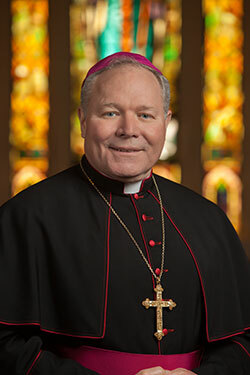 On December 13, 2016, Pope Francis appointed Bishop Burns to be the eighth Bishop of the Diocese of Dallas, Texas. 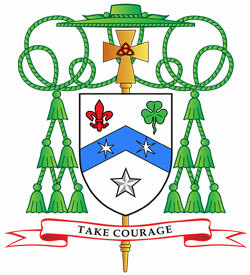 Bishop of Dallas, TX – U.S.A.
Argent, upon a chevron Azure two estoiles of the first; between to chief dexter a fleur-de-lis and to chief sinister a trefoil and to base a star, all of the second. The episcopal heraldic achievement, or bishop’s coat of arms, is composed of a shield, which is the central and most important part of the design and tells to whom the design belongs, the external ornamentation, which tells the owner’s position or rank, and a motto, placed upon a scroll. By heraldic tradition the design is described (blazoned) as if being done by the bearer with the shield being worn on the arm. Thus, where it applies the terms “sinister” and “dexter” are reversed as the design is viewed from the front. For the bishop who is without jurisdiction, as an Auxiliary Bishop, the entire shield of his design is given over to his personal arms. Bishop Kelly’s arms are based on the Kelly family design where the shield is silver (white) and the charges (symbols) are black. For difference, and for his deep devotion to the Blessed Virgin Mary, the chevron is now blue. The chevron is reminiscent of the mountains of Colorado, so dear to His Excellency’s youth and the chevron is charged with two estoiles (special, six pointed stars) that are taken from the mantle of the image of Our Lady of Guadalupe to remind all of the profound Hispanic influence in Texas, the “Lone Star State“, represented by the single star below the chevron. 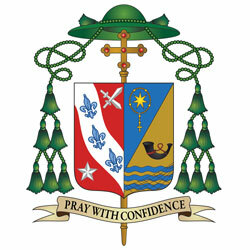 Above the chevron are a fleur-de-lis and a trefoil (the heraldic representation of a shamrock) to honor the Bishop’s Irish and French-Canadian heritage. For his motto, His Excellency, Bishop Kelly has adopted the phrase “TAKE COURAGE,” taken from the words of Jesus to the disciples as he walking towards them on the water (Mt. 14: 27): “Take courage, it is I, do not be afraid.” It is also the essence of the Archangel Gabriel‘s words to Mary at the Annunciation. In this phrase, His Excellency expresses that it is by God’s Strength that we have the courage to live as Christ has called us. Through the intercession of Mary we receive the grace to keep our eyes on the Lord and on the path he love leads us on. The achievement is completed with the external ornaments that are a gold (yellow) processional cross, that extends above and below the shield, and for Bishop Kelly is charged with the interlocking Irish knot-like loops, in red, to honor the Most Holy Trinity, and to recall his formation for priesthood at the seminary of that name on the campus of the University of Dallas in Irving, TX; There is also a pontifical hat, called a galero, with its six tassels, in three rows, on either side of the shield, all in green. These are the heraldic insignia of a prelate of the rank of bishop by instruction of the Holy See, of March 1969.